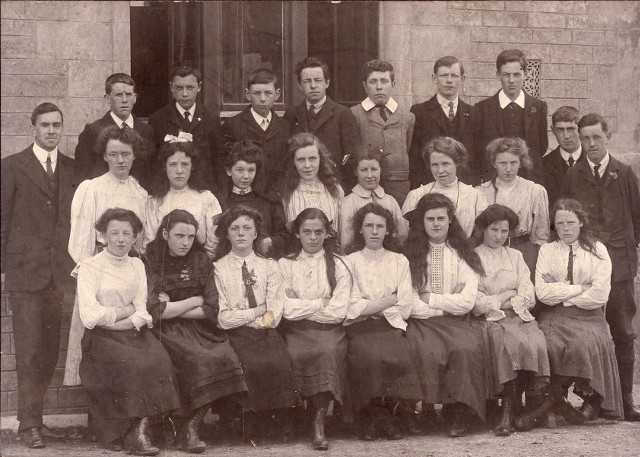 Invergordon Academy Intermediate Class 1909 � 1910. The notes on the back of the photo are hand-written and are therefore not that clear. All the male students are considered to be in the back row. Front row: Nellie Anderson, May Maciver, Eva Macdonald, Lily Baker, J. K. Ross, Jean Macrae, Jennie Urquhart, Davidina Crail.